LEADING ferry company Stena Line has invested in a new pilot boat to be used at Holyhead Port. The boat was built by Holyhead Marine Services Ltd to a design created by Camarc Design and will be used by Stena Line for pilotage operations in and out of the Port of Holyhead. 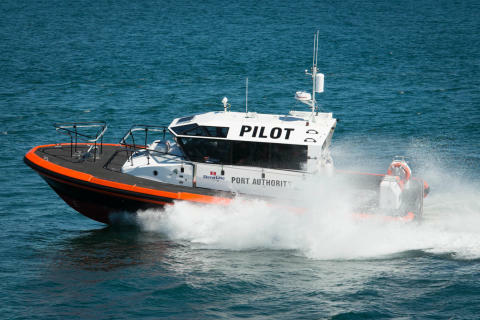 The pilot boat is 13 metres in length with a max speed of over 27 knots and will be used to transfer up to four pilots and two crew members to and from ships that are entering and leaving the Port of Holyhead. 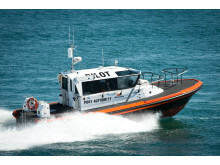 “This craft is a welcome addition to Holyhead Marine’s portfolio of composite pilot boats designed by Camarc Design and has extended the existing range to include this smaller and more economic model. In keeping with maritime tradition, the Port Authority has christened the new boat and called it St Columba,” added Nick.